Dermestidae are effective cleaners for Dubia roach colonies. They promote health by devouring dead roaches fast, which reduces moisture and helps keep bacteria under control. Dermestid beetles are an essentially hands-free, natural way to clear Dubia (and other) roach colonies of dead roach corpses. They don’t do all the work, but these carnivorous insects can substantially reduce and in some cases eliminate problems associated with moisture and bacteria build-up. As you may know, Dermestid beetles (aka: hide beetles or carrion beetles) are famous for their ability to completely strip dead animal flesh from bone while ignoring live animals. This makes them superb roach colony cleaners, and their services are much appreciated by many roach-keepers. Roaches die as a matter of course. In a captive colony, dead roach remains can quickly cause problems given the dark, warm, moist environment in which they’re often kept. 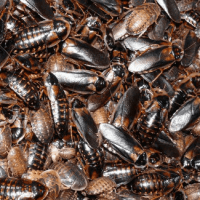 Dead roaches smell bad, but even worse, they can attract flies, bacteria, and mold. Dermestes to the rescue! 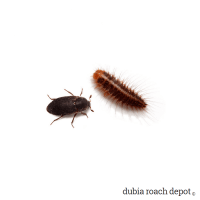 Each Cleaner Crew Kit comes with enough Dermestid beetles, larvae, pupae (a mix of about 20) to immediately establish a cleaning crew in your roach colony. You’ll probably get some eggs too, though we can’t say for sure how many because they’re microscopic. Eggs hatch in 1-3 days. NOTE: The mix of beetles and larvae in each kit reflects the current mix in the colony from which they’re collected. This mix changes over weeks and months. Dermestid beetles breed quickly, so large numbers aren’t necessary. All you need is healthy stock and a little time. One or two Kits is almost always enough for a single colony. The only drawback to starting with one Kit versus two in a large colony is that it takes longer to reach full cleaning capacity. However, Dermestidae are prolific eaters and fast breeders. When the environment is right, their population will rise to meet the available food supply. This usually takes just a matter of weeks, not months. If you don’t yet have a large colony, you can still buy Dermestid beetles as cleaner crews. They can live a surprisingly long time without food in a sparsely populated colony, and you can supplement with a small amount of dog food, beef jerky, or raw meat until the roach population increases if you want, just to be safe. It’s pretty easy to keep Dermestid beetles alive until your roach colony is large enough to sustain them. It just takes a little effort. To get a sense of the cleaning capability of our Dermestes Kits, see the chart below. You can start with as many as you like, but as mentioned, one or two Kits (plus a little time) is all the average cleaning job needs. For reference: Adult Dermestid beetles lay eggs immediately. Eggs hatch in just three or four days, and larvae reach sexual maturity in about 50 days. Dermestid beetles live a total of about six months. Dermestid beetles can fly at temperatures above roughly 95°F. This means that you may need a lid or screen for your Dubia colony if you don’t want the beetles to fly away. However, you don’t have to worry if your Dubia are feeders and/or you keep them below their fly-away temperature. Dermestid beetles and larvae can be shipped safely in lower temperatures. Please see our heat & cold pack page for more information as well as suggestions on when to use a heat or cold pack. Maintaining a group of Dermestid beetle cleaner crews inside a roach colony is usually an easy task requiring little effort. However, there are a few things to watch out for. Nothing earth shattering, but a little information up front can help ensure that the process goes smoothly. To that end we’ve written down some thoughts in our Dermestes cleaner crew “how-to”. It provides instructions and explains what to expect as well as how to manage Dermestid beetles alone or in combination with other cleaner crew species. 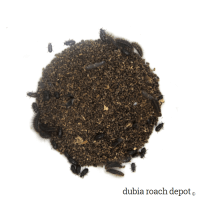 Dermestid beetles are efficient cleaner crews in Dubia roach colonies, but they could be considered pests in certain situations. Please be sure you understand the risks before buying these or other insects. Dermestid beetles (sometimes called carpet, carrion, and larder beetles) are part of the Dermestidae family. This is a group of carnivorous insects that specialize in eating dead, decaying animal flesh. This makes them excellent cleaner crews for Dubia colonies because they eliminate roach carcasses that would otherwise decompose, smell, and become a host for bacteria and fungi. We use them in our colonies partly because they reduce the amount of time we have to spend cleaning bins, and partly because they provide us with a sort of “insurance policy” against the damage that can result from pathogens that accompany the build-up of decaying animal matter. These beetles are Dermestes maculatus, which are the same ones taxidermists, museums, and forensic investigators use to remove flesh from bone. The adult form of this insect is a small, black, carnivorous, flesh-scavenging beetle. Immature larvae have small, hair-like projections along the length of their body and range from microscopic in size to about a quarter inch. They also eat dead flesh. Adult female beetles lay their eggs in moist locations, usually on or near a food supply. In our colony that usually means inside roach carcasses, but may also include the roach’s water supply, which is harmless for the roaches. Upon hatching, hungry larvae emerge and immediately search for food. Because they’re only interested in dead flesh, these little buggers go about their lives without paying much attention to the roaches with whom they share their enclosure. That is, of course, until the roaches die. Then all bets are off, and both the beetles and larvae devour them voraciously. Importantly, Dubia roaches don’t seem to mind sharing space with Dermestid beetles. We’ve seen no evidence of colony stress from the relationship. In fact, the relationship is so symbiotic that we often see Dubia and Dermestes quietly huddled together in small groups, and the beetles use the roaches for cover when we disturb the colony. Dermestes maculatus is indigenous to North America. They are common in the wild, and beetles and larvae can often be collected from dead animal carcasses. However, wild-caught insects often harbor mites. For this reason we strongly recommend buying cultivated Dermestid beetles from a healthy, captive colony rather than collecting them from roadkill or other dead animals in the wild. Our Dermestid beetles are of course mite-free. The Dermestes reproductive cycle is short by necessity. It takes about seven weeks to go from egg to adult. Once mature, adult beetles live about 90 days. While they have wings, they only fly at temperatures above 95°F or so. They are opportunistic feeders that rely on food sources that may be gone in just a week or two, so they lay eggs quickly. Eggs hatch in just a few days. Females can also wait until conditions are to their liking before laying their eggs. 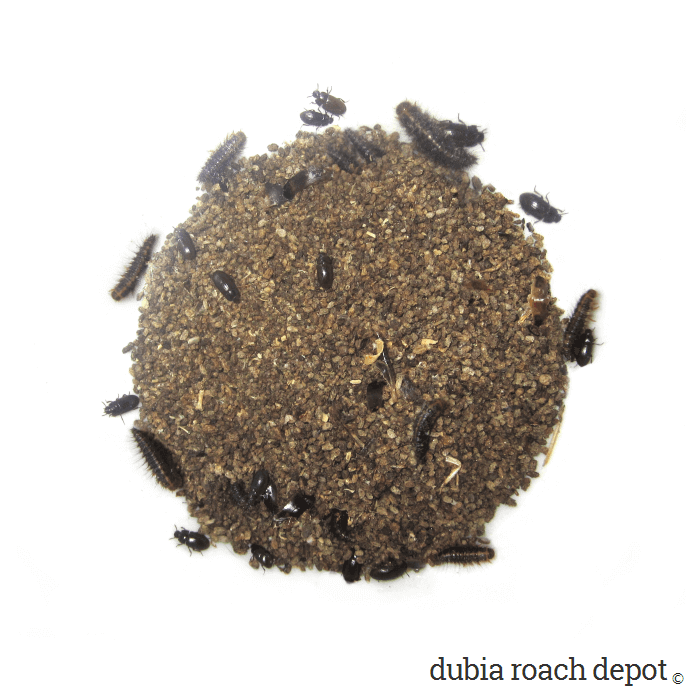 This means that within a Dubia roach colony, the beetle population will establish much faster than the roaches. If you have 100 roaches, for example, beetle population will stabilize around the rate of die-off of 100 roaches. More roach carcasses become available as your roach population increases, and the Dermestes population will quickly adjust to the new food supply.